Import substitution industrialization (ISI) is a trade and economic policy which advocates replacing foreign imports with domestic production. ISI is based on the premise that a country should attempt to reduce its foreign dependency through the local production of industrialized products. The term primarily refers to 20th-century development economics policies, although it has been advocated since the 18th century by economists such as Friedrich List and Alexander Hamilton. In the context of Latin American development, the term "Latin American structuralism" refers to the era of import substitution industrialization in many Latin American countries from the 1950s until the 1980s. The theories behind Latin American structuralism and ISI were organized in the works of Raúl Prebisch, Hans Singer, Celso Furtado, and other structural economic thinkers, and gained prominence with the creation of the United Nations Economic Commission for Latin America and the Caribbean (UNECLAC or CEPAL). While the theorists behind ISI or Latin American structuralism were not homogeneous and did not belong to one particular school of economic thought, ISI and Latin American structuralism and the theorists who developed its economic framework shared a basic common belief in a state-directed, centrally planned form of economic development. In promoting state-induced industrialization through governmental spending through the infant industry argument, ISI and Latin American structuralist approaches to development are largely influenced by a wide range of Keynesian, communitarian, and socialist economic thought. ISI is often associated and linked with dependency theory, although the latter has traditionally adopted a much broader Marxist sociological framework in addressing what are perceived to be the origins of underdevelopment through the historical effects of colonialism, Eurocentrism, and neoliberalism. Even though ISI is a development theory, its political implementation and theoretical rationale are rooted in trade theory: it has been argued that all or virtually all nations that have industrialized have followed ISI. 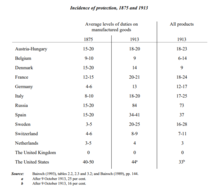 Import substitution was heavily practiced during the mid-20th century as a form of developmental theory that advocated increased productivity and economic gains within a country. This was an inward-looking economic theory practiced by developing nations after WW2. Many economists at the time considered the ISI approach as a remedy to mass poverty: bringing a third-world country to first-world status through national industrialization. Mass poverty is defined thusly: "the dominance of agricultural and mineral activities – in the low-income countries, and in their inability, because of their structure, to profit from international trade," (Bruton 905). 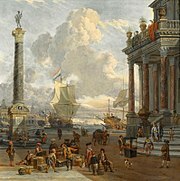 Mercantilist economic theory and practices of the 16th, 17th, and 18th centuries frequently advocated building up domestic manufacturing and import substitution. In the early United States, the Hamiltonian economic program, specifically the third report and the magnum opus of Alexander Hamilton, the Report on Manufactures, advocated for the U.S. to become self-sufficient in manufactured goods. This formed the basis of the American School in economics, which was an influential force in the United States during its 19th-century industrialization. Werner Baer contends that all countries that have industrialized after the United Kingdom went through a stage of ISI, in which the large part of investment in industry was directed to replace imports (Baer, pp. 95–96). Going farther, in his book Kicking Away the Ladder, Korean economist Ha-Joon Chang also argues, based on economic history, that all major developed countries, including the United Kingdom, used interventionist economic policies to promote industrialization and protected national companies until they had reached a level of development in which they were able to compete in the global market, after which those countries adopted free market discourses directed at other countries to obtain two objectives: open their markets to local products and prevent them from adopting the same development strategies that led to the developed nations' industrialization. As a set of development policies, ISI policies are theoretically grounded on the Prebisch–Singer thesis, on the infant industry argument, and on Keynesian economics. From these postulates, it derives a body of practices, which are commonly: an active industrial policy to subsidize and orchestrate production of strategic substitutes, protective barriers to trade (such as tariffs), an overvalued currency to help manufacturers import capital goods (heavy machinery), and discouragement of foreign direct investment. By placing high tariffs on imports and other protectionist, inward-looking trade policies, the citizens of any given country, using a simple supply-and-demand rationale, will substitute the less-expensive good for the more expensive. The primary industry of importance would gather its resources, such as labor from other industries in this situation; the industrial sector would use resources, capital, and labor from the agricultural sector. In time, a third-world country would look and behave similar to a first-world country, and with a new accumulation of capital and an increase of TFP (total factor productivity) the nation's industry would, in principle, be capable of trading internationally and competing in the world market. Bishwanath Goldar, in his paper ‘Import Substitution, Industrial Concentration and Productivity Growth in Indian Manufacturing’ wrote: "Earlier studies on productivity for the industrial sector of developing countries have indicated that increases in total factor productivity, (TFP) are an important source of industrial growth," (Goldar 143). He continued: "a higher growth rate in output, other things remaining the same, would enable the industry to attain a higher rate of technological progress (since more investment would be made) and create a situation in which the constituent firms could take greater advantage of scale economies;" it is believed that ISI will allow this (Goldar 148). In many cases, however, these assertions did not apply. On several occasions, the Brazilian ISI process, which occurred from 1930 until the end of the 1980s, involved currency devaluation as a means of boosting exports and discouraging imports (thus promoting the consumption of locally manufactured products), as well as the adoption of different exchange rates for importing capital goods and for importing consumer goods. Moreover, government policies toward investment were not always opposed to foreign capital: the Brazilian industrialization process was based on a tripod which involved governmental, private, and foreign capital, the first being directed to infrastructure and heavy industry, the second to manufacturing consumer goods, and the third, to the production of durable goods (such as automobiles). Volkswagen, Ford, GM, and Mercedes all established production facilities in Brazil in the 1950s and 1960s. The principal concept underlying ISI can thus be described as an attempt to reduce foreign dependency of a country's economy through local production of industrialized products, whether through national or foreign investment, for domestic or foreign consumption. It should be noted, as well, that import substitution does not mean import elimination: as a country industrializes, it begins to import new materials that become necessary for its industries, such as petroleum, chemicals, and other raw materials it may have formerly lacked. In 2006, Michael Shuman proposed Local ownership import substituting (LOIS), as an alternative to neoliberalism. It rejects the ideology of there is no alternative. Shuman claims LOIS businesses are long term wealth generators, are less likely to exit destructively and have higher economic multipliers. Import substitution policies were adopted by most nations in Latin America from the 1930s until the late 1980s. The initial date is largely attributed to the impact of the Great Depression of the 1930s, when Latin American countries, which exported primary products and imported almost all of the industrialized goods they consumed, were prevented from importing due to a sharp decline in their foreign sales. This served as an incentive for the domestic production of the goods they needed. The first steps in import substitution were less theoretical and more pragmatic choices on how to face the limitations imposed by recession, even though the governments in Argentina (Juan Domingo Perón) and Brazil (Getúlio Vargas) had the precedent of Fascist Italy (and, to some extent, the Soviet Union) as inspirations of state-induced industrialization. Positivist thinking, which sought a "strong government" to "modernize" society, played a major influence on Latin American military thinking in the 20th century. Among the officials, many of whom rose to power, like Perón and Vargas, industrialization (especially steel production) was synonymous with "progress" and was naturally placed as a priority. ISI gained a theoretical foundation only in the 1950s, when Argentine economist and UNECLAC head Raúl Prebisch was a visible proponent of the idea, as well as Brazilian economist Celso Furtado. 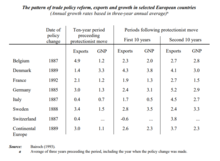 Prebisch had experience running his country’s central bank and started to question the model of export-led growth. Prebisch came to the conclusion that the participants in the free-trade regime had unequal power, and that the central economies (particularly Britain and the United States) that manufactured industrial goods could control the price of their exports. These unequal powers were taking the wealth from third world countries leaving them with no way to prosper. He believed that developing countries needed to create local vertical linkages, and they could only succeed by creating industries that used the primary products already being produced domestically. The tariffs were designed to allow domestic infant industries to prosper. In doing so Prebisch’s predicted many benefits, the dependence for imports will lower and they will not be forced to sell agricultural goods for low prices to pay for industrial goods the income rate would go up, and the country itself would have a strong growth. ISI was most successful in countries with large populations and income levels which allowed for the consumption of locally produced products. Latin American countries such as Argentina, Brazil, Mexico, and (to a lesser extent) Chile, Uruguay and Venezuela, had the most success with ISI. This is because while the investment to produce cheap consumer products may be profitable in small markets, the same cannot be said for capital-intensive industries, such as automobiles and heavy machinery, which depend on larger markets to survive. Thus, smaller and poorer countries, such as Ecuador, Honduras, and the Dominican Republic, could implement ISI only to a limited extent. Peru implemented ISI in 1961, and the policy lasted through to the end of the decade in some form. To overcome the difficulties of implementing ISI in small-scale economies, proponents of this economic policy, some within UNECLAC, suggested two alternatives to enlarge consumer markets: income redistribution within each country, through agrarian reform and other initiatives aimed at bringing Latin America's enormous marginalized population into the consumer market, and regional integration through initiatives such as the Latin American Free Trade Association (ALALC), which would allow for the products of one country to be sold in another. In Latin American countries in which ISI was most successful, it was accompanied by structural changes to the government. Old neocolonial governments were replaced by more-or-less democratic governments. Banks and utilities and certain foreign-owned companies were nationalized or had their ownership transferred to local businesspeople. Many economists contend that ISI failed in Latin America and was one of many factors leading to the so-called lost decade of Latin American economics, while others[who?] contend that ISI led to the "Mexican Miracle," the period from 1940 to 1975, in which annual economic growth stood at 6% or higher. "By the early 1960s, domestic industry supplied 95% of Mexico's and 98% of Brazil's consumer goods. Between 1950 and 1980, Latin America's industrial output went up six times, keeping well ahead of population growth. Infant mortality fell from 107 per 1,000 live births in 1960 to 69 per 1,000 in 1980, [and] life expectancy rose from 52 to 64 years. In the mid-1950s, Latin America's economies were growing faster than those of the industrialized West." Thanks to the policy of import substitution by tariffs, many other industries have been developed: for example, in the aviation industry, Russia is developing a significant range of new aircraft. The aerospace industry is expected to reach an annual turnover of $50 billion by 2025. In 2017, the pharmaceutical industry represents $5 billion and will probably double in 2022, whereas ten years earlier the country's medical industry was negligible. The country has set itself the objective of producing 90% of the drugs deemed "vital" on its territory. In 2017, Russia spends only $6 billion on imported cars, while the value of imports reached $20 billion in 2007. The energy sector is also booming: the country has succeeded in developing its own technology and has continued to develop oil drilling and gas production centres. While import substitution policies might create jobs in the short run, as domestic producers replace foreign producers, both output and growth will be lower than it would otherwise have been in the long run. Import substitution denies the country the benefits to be gained from specialisation and foreign imports. The law of comparative advantage shows how countries will gain from trade. Moreover, protectionism leads to dynamic inefficiency, as domestic producers have no incentive from foreign competitors to reduce costs or improve products. Import substitution can impede growth through poor allocation of resources, and its effect on exchange rates harms exports. Despite some apparent gains, import substitution was "both unsustainable over time and produced high economic and social costs." Given import substitution's dependence upon its developed and isolated markets within Latin America, it relied upon the growth of a market that was limited in size. In most cases, the lack of experience in manufacturing and the lack of competition, reduced innovation and efficiency, which restrained the quality of Latin American produced goods, and protectionist policies kept prices high. In addition, power was concentrated in the hands of a few, which decreased the incentive for entrepreneurial development. Contrary to its intent, import substitution exacerbated inequality in Latin America. [not in citation given] With a poverty rate greater than 30%, the internal demand that import substitution relied upon was not available. Protective policies and state ownership reduced the incentives for business risk, resulting in decreased efficiency. Lastly, the large deficits and debts resulting from import substitution policies are largely cred for the resulting Latin American crisis of the 1980s. Critics of neoliberal economics, however, argue that the elimination of tariffs in nations with immature tax systems reduces the government revenues that are required to service public debt. ^ A Comprehensive Dictionary of Economics p.88, ed. Nelson Brian 2009. ^ Mehmet, Ozay (1999). Westernizing the Third World: The Eurocentricity of Economic Development. London: Routledge. ^ Chang, Ha-Joon (2002). Kicking Away the Ladder: Development Strategy in Historical Perspective. London: Anthem Press. ^ Street, James H.; James, Dilmus D. (1982). "Structuralism, and Dependency in Latin America." Journal of Economic Issues, 16(3) p. 673-689. ^ Konadu-Agyemang, Kwadwo (2000). "The Best of Times and the Worst of Times: Structural Adjustment Programs and Uneven Development in Africa: The Case of Ghana. "Professional Geographer, 52(3) p. 469-483. ^ Hauss, Charles (2014). omparative Politics: Domestic Responses to Global Challenges (9 ed.). Cengage Learning. p. 417. ISBN 1305161750. ^ "History of ECLAC". Economic Commission for Latin America and the Caribbean. United Nations. Retrieved 10 October 2016. ^ Renato, Aguilar (1986). "Latin American structuralism and exogenous factors. "Social Science Information, 25(1) p. 227-290. ^ Arndt, H.W. (1985). "The Origins of Structuralism. "World Development, 13(2) p. 151-159. ^ Perreault, Thomas; Martin, Patricia (2005). "Geographies of neoliberalism in Latin America. "Environment and Planning A, 37, p. 191-201. ^ Shuman, M. H. (2006). The Small-Mart Revolution: How Local Businesses are Beating the Global Competition. San Francisco, CA: Berrett-Koehler. ^ "Cage Match: TINA vs LOIS". treehugger.com. Retrieved 4 April 2018. ^ a b H., Hunt, Michael. The world transformed : 1945 to the present. p. 227. ISBN 978-0-19-937102-0. OCLC 907585907. ^ a b Hunt, Michael (2014). The World Transformed. New York: Oxford University Press. pp. 227–228. ISBN 978-0-19-937102-0. ^ Blouet, Olwyn; Olwyn Blouet; Brian W. Blouet (2002). Latin America and the Caribbean: A Systematic and Regional Survey. New York: John Wiley. ^ "ECONOMIC HISTORY AND THE ECONOMY OF PERU". www.sjsu.edu. Retrieved 4 April 2018. ^ a b Franko, P. M. (2007). The puzzle of Latin American economic development (3rd ed.). Lanham: Rowman & Littlefield. ^ Lustig, Lustig, Luis Lopez-Calva and Eduardo Ortiz-Juarez, 2013, “Deconstructing the Decline in Inequality in Latin America,” World Bank Policy Research Working Paper No. 6552, Washington, July. ^ Eduardo Lora, 2012, "Structural Reforms in Latin America: What Has Been Reformed and How to Measure It (Updated version)" Inter-American Development Bank Working Paper #346, Washington, December. ^ Jeffrey Sachs (1985), "External Debt and Macroeconomic Performance in Latin America and East Asia," Brookings Papers on Economic Activity 2, pp.523–573. Jeffry A. Frieden: Global Capitalism. Chasteen, John Charles. 2001. Born in Blood and Fire. pages 226–228. Reyna, José Luis & Weinert, Richard S. 1977. Authoritarianism in Mexico. Philadelphia, Pennsylvania: Institute for the Study of Human Issues, Inc. pages 067–107. Bruton, Henry J. "A Reconsideration of Import Substitution." Journal of Economic Literature. 36.2 (1998): 903–936. Print. Bishwanath, Goldar. "IMPORT SUBSTITUTION, INDUSTRIAL CONCENTRATION AND PRODUCTIVITY GROWTH IN INDIAN MANUFACTURING* PRODUCTIVITY GROWTH IN INDIAN MANUFACTURING." Oxford bulletin of Economics and Statistics. 48.2 (1986): 143–164. Print. The current page of the author of LOIS, with audio, video and his new book.